HomenewsUncategorizedIs CRM with social media growing less trustworthy? Comments made on social media can sometimes give businesses a skewed perception of consumer sentiment. Learn how to correct the data to inform business decisions. CRM with social media- Social media is a godsend to marketing departments everywhere. For decades, they employed endless, semisuccessful strategies to goad customers into sharing information about their likes, dislikes, preferences and wish lists. In the last 10 years, the marketers’ gift of social media grew into a forum where customers log on and talk — all at once, all the time. CRM with social media followed shortly after, exploiting those conversations to give marketers invaluable insights into the customer mind — spontaneous and unguarded insights. If only those insights were reliable. Acknowledging that social media platforms, such as Facebook, Twitter and Instagram, provide oceans of useful data about customers — how they think and feel and what they want — it’s important to understand exactly what’s happening in a social media forum when the enterprise brand is mentioned and to interpret the data accordingly. Social media discussions tend to be loosely structured. More often than not, when a brand surfaces in a social media discussion, it does so incidentally. That is, it isn’t the object of discussion; it just happened to come up. For instance, a bicycle manufacturer’s brand is mentioned in a group discussion by cycling enthusiasts, and a particular bicycle model is spoken of negatively. But neither the brand nor the bicycle is the topic; the discussion was about extreme mountain biking. Social media participants are socially diverse. 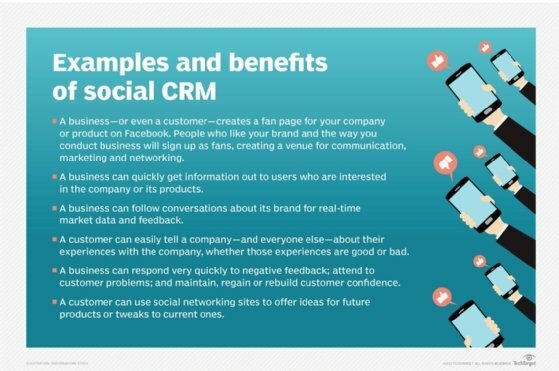 Using CRM with social media, businesses take whatever they get. They can be so excited by the spontaneity and presumed honesty of the input that they pay little or no attention to the profile of the customer doing the talking. Sometimes, social media participants jump in just to participate, with little concern for the content of their post — it’s being included that counts. In the above example, several cyclists might join in dissing the brand just to be present, when they don’t really dislike that bike at all. Social media omits the most meaningful metrics. In marketing surveys of old, at least a cursory customer profile was attached to the survey data: the age and/or gender of the customer, if nothing else. That’s usually absent in brand sentiment analysis. Worse, no gradations are available in social sentiment data — nothing like the “strongly agree … strongly disagree” Likert scale with which everyone is so familiar. In the biking example, there is no indication of how strongly anyone feels about the hapless bicycle being criticized, with the possible exception of the first participant. This leaves a negative brand sentiment analysis, due to keyword-based mining of dialogues that really weren’t about the brand — both uninformative and misleading. Suppose, for instance, that the original poster used that particular bicycle out of necessity, rather than choice and that it’s a bike that wasn’t appropriate for the terrain in question? Most people spend enough time on social media to understand there’s a difference between writing a post expressing something important vs. piling on when a bandwagon starts rolling. The original opinion can be trustworthy, and by going beyond the keywords into the surrounding text, you can often get a measure of the intensity of the sentiment. Beyond that, the amount of dissent or counteropinion found in a discussion is often a random function of the personalities speaking. Some people go along because they authentically share the same opinion; some pile on just because piling on is fun. But some people express a different view because they truly feel differently, and others have trouble doing so, despite what they actually think, because they are, by nature, conformists. Social media discussions can be too random, too spontaneous and too unstructured to be trusted. The post Is CRM with social media growing less trustworthy? appeared first on erpinnews.